Qualey, Joseph P. Lifelong resident of Quincy passed away peacefully Sept 12. Joe was 93 years old. He was a Decorated WWll Veteran in the US Army. Joe was the recipient of the 2 Purple Hearts and the Bronze Star. He served in the 15th infantry regiment on the Campaign in No. Africa, Sicily, Italy, France and Germany. He served in the same regiment as Audie Murphy. Joe was a retired Captain on the QFD for 40 years. Joe was the son of the late Patrick and Nora (Langan) Qualey. Cherished brother of Marie Phelan of Quincy and the late Charles J. Phelan Sr. Cherished Uncle of Charles Phelan Jr., Annmarie Phelan and Noreen McEachern all of Quincy. Also survived by many great nieces and a nephew. Relatives and friends are respectfully invited to attend the Mass of Christian Burial Tuesday at 10:30 in St. Ann’s Church, Quincy. Visiting hour prior to the Mass from 9-10 AM in the Hamel-Lydon Chapel, 650 Hancock St., Quincy. He will be laid to rest with his parents in Pine Hill Cemetery, Quincy. 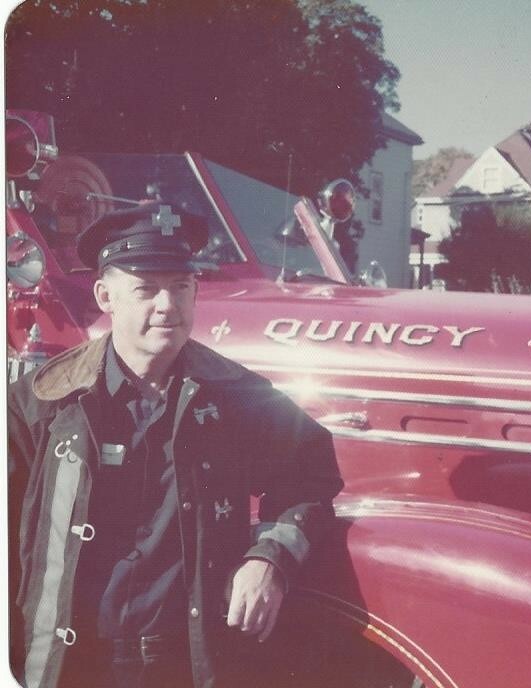 In lieu of flowers, donations in his memory may be made to the Quincy Firefighters Memorial Fund, 100 Quincy Ave. c/o Quincy Credit Union, Attn. Amy Kelly, Quincy, MA 02169.